The novel that the 1984 film was based on. Based around the JFK assasinaion conspiracy. Bit of a different end from the film. Two border policeman find a buried jeep, a body and a rifle in the Texas desert. They also find almost a million dollars in cash. Before long their tentative inquiries as to the identity of the corpse bring the spooks down on their heads - from the military to the FBI. The body dates back to 1963 and the rifle is a Mauser...An interesting thriller which contains no new insights about the Kennedy assassination; it does however expose the exploitation of migrant labour along the border, the immigration dept conspiring with bosses to deport workers before they are paid for their labour. The culmination of the book rests upon a piece of misidentification, one made by the Dallas Police Department on the day of Kennedy's assassination - a disputed piece of evidence that deceives the two policemen throughout the novel, just as it did the world for a few hours on 11/22/63.Slow to start, but quite gripping by the end, and a nice addition to JFK folklore. George La Fountaine - George La Fountaine attended high school in Seattle, WA. He attended classes at Pasadena Playhouse from 1955-57. He served as a marine in the Korean War, where he was promoted to sergeant. He's worked in Hollywood as a lighting director and consultant. His first novel, Two Minute Warning, was published in 1975 and came out as a movie the following year. Suspense thriller about an assassin at a Super Bowl game. It had an all-star cast, but received so-so reviews. 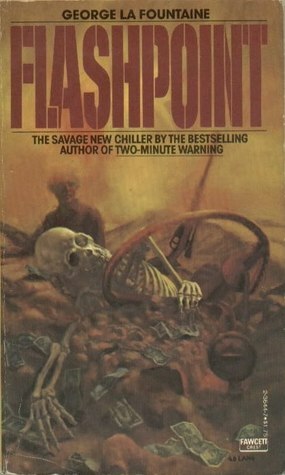 The same year, Flashpoint was published, but the movie didn't come out until 1984. According to a New York Times review Flashpoint is "much better--more original, written with more security, and with a chilling impact in its last pages. "*He published three more novels over the next eight years--The Scott-Dunlap Ring, 1978; The Killing Seed, 1980, and The Long Walk, 1986. The Long Walk won critical praise for its depiction of a Green Beret POW's return home from Vietnam, and his recovery from the effects of years of torture.After 1986, La Fountaine dropped off the radar until Dec. 27, 2010, when the first of ten novels appeared in 's Kindle Store, some of them published within a month of each other. This suggests the author had run into difficulty finding traditional publishing outlets, and, as so many are doing these days, took to the self-publishing route for a backlog of novels he'd been writing over the previous two decades.